Well that was quick. 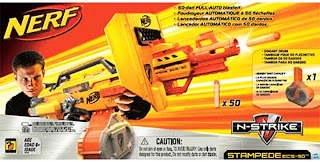 Reported to us by Nerf2me2 are the new Nerf Stinger blasters which are the new single shot blaster in the Dart Tag range and apparently are essentially reshelled Jolts; he's picked them up from his local Toys R Us in two different packs. The one detailed in the UK Argos catalogue is the 'Target Tag' kit which comes with a blue cased Stinger and a plastic target. There's also a two player 'Dart Duel' pack which is similar to the 2 player Sharp Shot kit, coming with two blasters in red and green, six darts (with unique coloured tips matching the blasters), protective eyewear (with matching colour lenses) and the velcro jersey smocks. Thanks Dustin for the heads up! UK Nerf: Elite Alpha Trooper - It's Real! 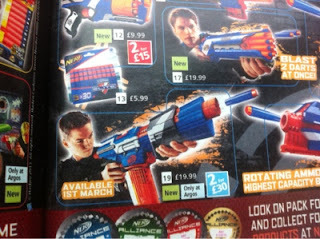 Well slap me down next time I prematurely am sceptical of a rumour in the Nerf world, because all that talk of an Elite Alpha Trooper a few weeks ago has now been all but confirmed by UK retailer Argos in their catalogue. 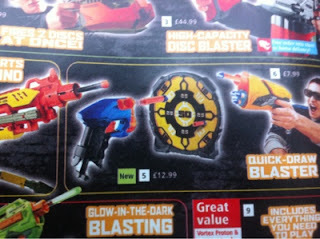 The catalogue also has a pic of what looks like another single shot with a similar priming mechanism to the Jolt/Triad. What's interesting though is it looks like its provided with a target and the darts stick to it (and given its pictured next to a Sharp Shot) suggests its part of the Dart Tag line. New colours for Dart Tag? Same darts or updated darts do you think? 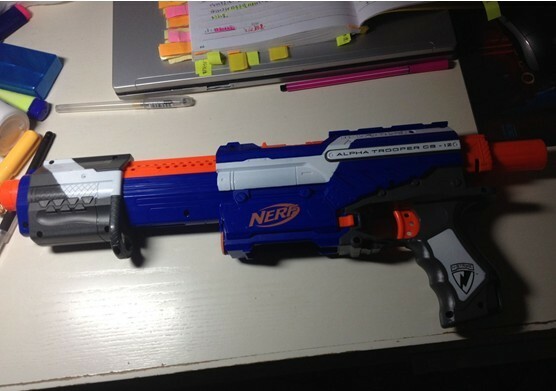 Cheers Ray for the heads up and UK Nerf for the intel. 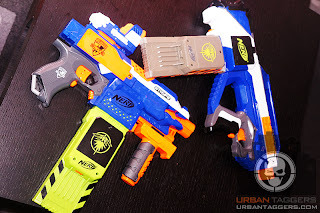 Nerf N-Strike Elite Stryfe: says no to Firefly..
Nerf N-Strike Elite Firestrike: just a few things..
Sure enough, I picked up the US spec'd N-Strike Elite Firestrike and it's significantly more powerful than our domestic detuned grey trigger units. It's all in the spring so modders won't really care, but whereas the grey trigger model feels even at times weaker than a traditional Nitefinder, the orange trigger unit packs some significant punch; very cool. Secondly, I noticed the Firestrike is completely void of any digital camo etching as with many of the other Elite blasters. Wonder why? Thirdly- I don't think it's just me, but the Firestrike's plastic looks to be slightly different to other Elite blasters and somewhat shinier. It's also therefore looking darker and almost purple; I can't depict it accurately in photos, but for those of you who have one already, you'll know what I mean. 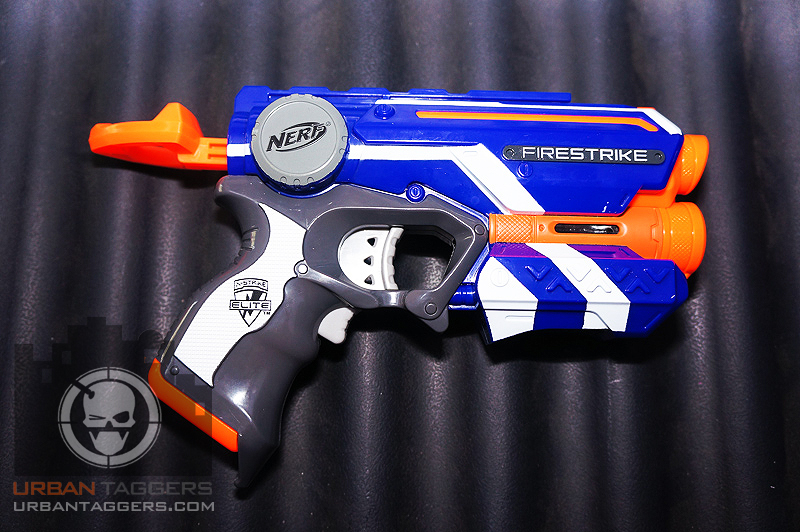 There's rumours the Elite Rayven is a darker blue/purple, but I haven't really found that to be the case in real life, but the Firestrike definitely looks different. The N-Strike Rayven CS-18 was one of the last of the new N-Strike blasters to be released before we started to move on to the all new N-Strike Elite series. It was (and we'd like to take credit for this a lil!) 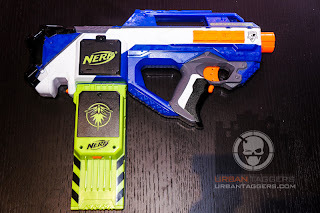 well received by fans and Nerf probably felt it needed more air time than to be slowly phased out with the other N-Strike gear, so in an interesting move, Nerf have re-released the Rayven as an N-Strike Elite blaster. 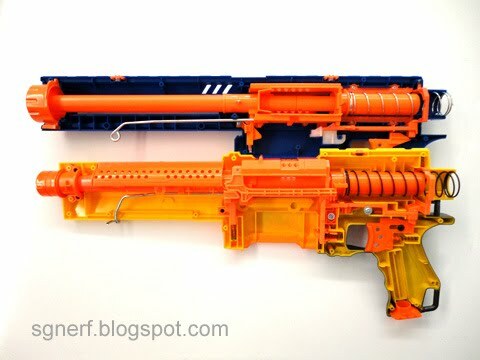 Unlike the Retaliator (which was a souped up and renamed Recon with a different stock and a grip attachment) or the Rampage (a souped up and renamed Raider without stock and a smaller capacity drum), the Rayven still kept its name and status as a Firefly clip blaster, only now it sports the new Elite colours (albeit the original Rayven never sported the N-Strike colours anyway!) 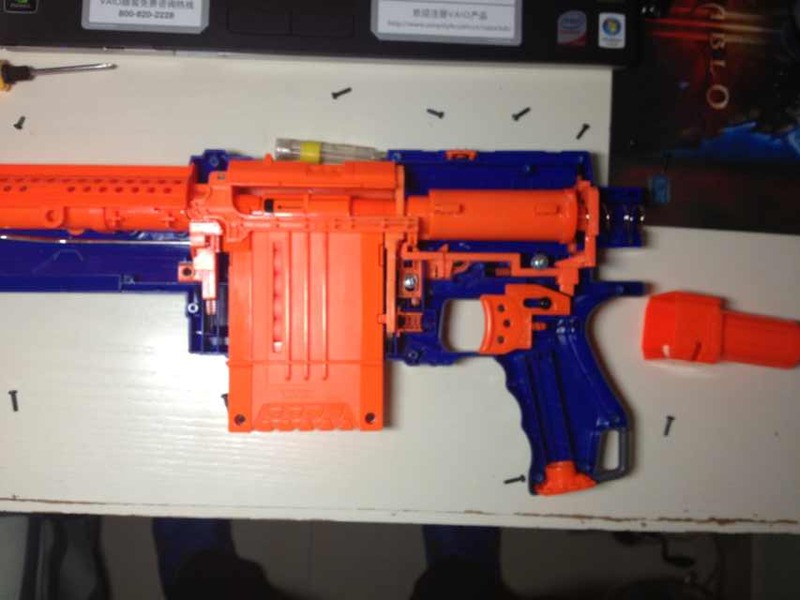 and a souped up motor (similar to the Stryfe and Hailfire I'm guessing). It also comes equipped with new Elite glow in the dark darts. Nerf Vortex Diatron: Just for something different.. 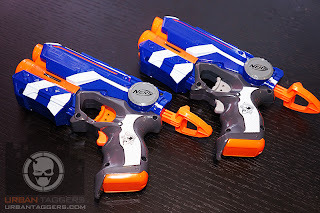 While I'm not quite convinced the Vortex line has been as successful as Nerf would have liked it to be, I myself am still a fan, mainly because of the futuristic styling of the blasters themselves. 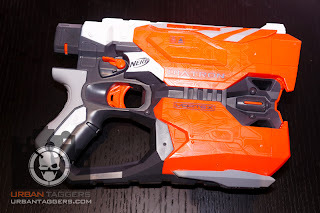 Since the original green lineup of Vortex blasters, it had been pretty quiet till out of the blue last year the Pyragon just showed up out of nowhere and very quickly became a real fan favourite (the Pyragon is my personal blaster of choice now). Nerf may be trying to replicate this in 2013- again out of the blue a new Vortex blaster shows up and screams to be heard. This time, while sporting the popular white, red and black colour scheme of it's older brother, the new Vortex Diatron is something completely new and brings some quirky new things to the table. More after the jump. 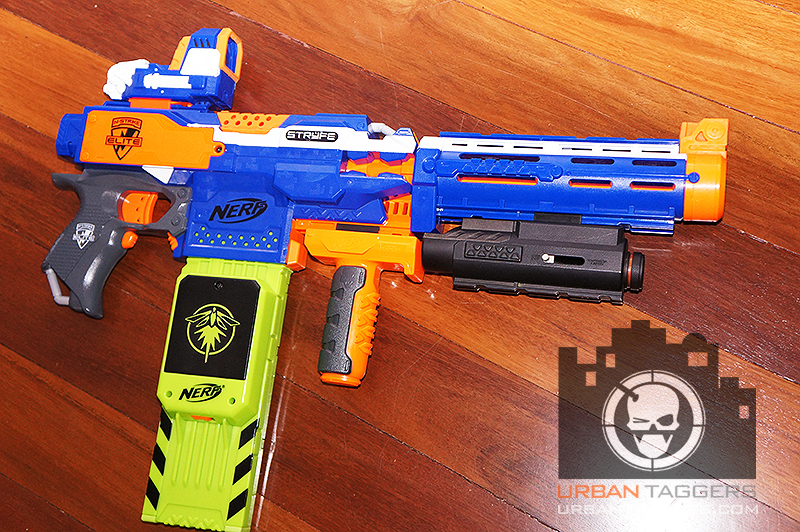 Nerf N-Strike Elite Strongarm: Nice shootin' Tex! Of all the all new N-Strike Elite series of blasters, the new Roughcut 2x4 has been the one blaster I’ve been waiting for since the 2nd round of Elite gear was announced/leaked; it sounded the most interesting and I liked its general design. 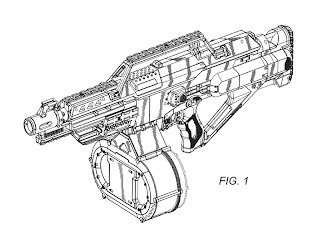 Given its form factor, it’s a suitable successor to the old N-Strike barrel Break IX-2 being a shot gun styled unit complete with the simultaneous dual round functionality but also holds 8 rounds with an added bonus of slam fire. Sounds cool? It is. Sorta.. 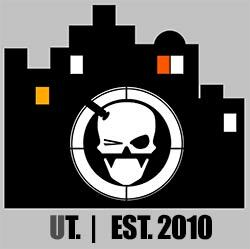 Although not due for domestic release till mid 2013, we still got our hands on one (Thanks to Neil from the Canberra and Southern NSW Dart Tag crew) to have a bit of a play. 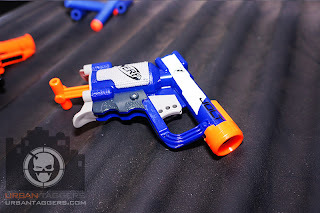 So much buzz over these lil "noisy crickets"- the Jolt was the blaster that came out of nowhere and very quickly captured the hearts of Nerfers all over with their direct plunger-in-the-palm-of-your-hand design and impressive performances for such a cheap and small lil thing. When the Elite series was announced, a few pics surfaced to suggest the Jolt would get the Elite treatment; then there was the confusing release of the Triad EX-3 which followed very similar design aesthetics albeit a 3 round shooter. The Nerf N-Strike Elite Firestrike is a single shot blaster seen to be the successor to the much loved N-Strike Nitefinder EX-3. 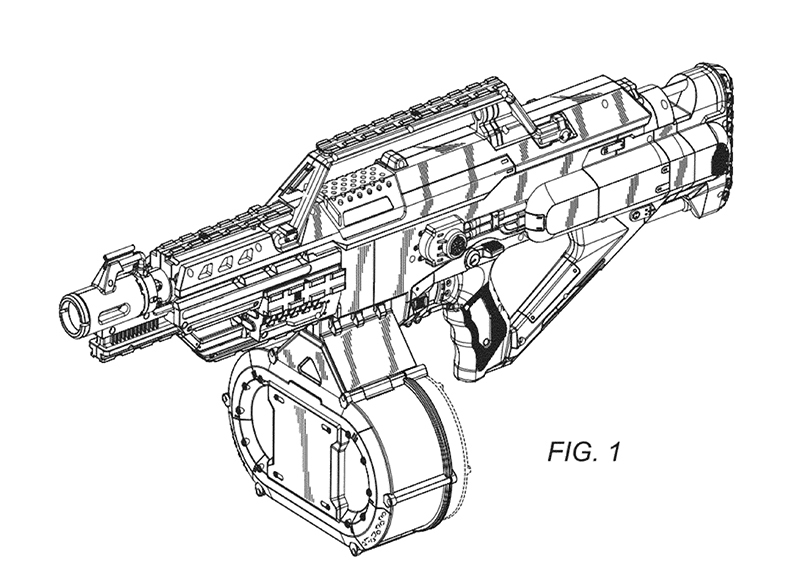 It bares similar traits to it's older brother with the ring pull priming arm and red dot targeting light but in a more refined, compact styled form. Naturally the domestic model bares the grey trigger aesthetics and the de-tuned performances but we still found it ok to use. More after the jump. Rumours: More on the Elite Alpha Trooper..
Ok, so something brought to our attention by one of our readers 'Iamiamomo' has me thinking twice about my previous post. 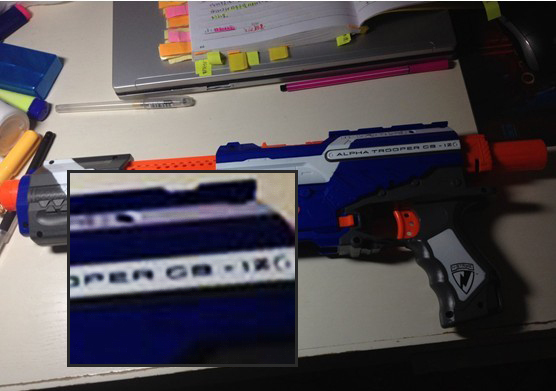 Firstly, zooming in to the name plaque of the blaster shows not 'CS-18' but "CS-12"..
Rumours: Elite Alpha Trooper? Nahhh.. It was spotted on Chinese site Baidu and we've received several emails regarding it: it's touted as a "pre production release Elite Alpha Trooper" and while the idea is appealing, I'm just not convinced. 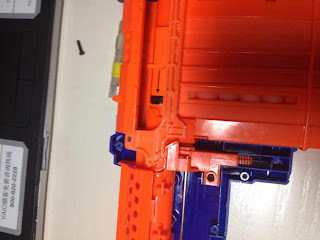 I normally like to just post this info and leave the readers to decide, but for the want of NOT looking like a gullible idiot..
From this image, you can see it's brandishing the original 'N-Strike' logo- something that we now know doesn't occur on Elite blasters (The Jolt and Reflex are featuring repaints, but aren't presented as Elite gear). It's still called an "Alpha Trooper CS-18". Other than the Rayven (which is still pretty recent in release, as opposed to the AT which has been around for 2 years) you'll notice every other Elite version has been renamed. Rumours: Stampede 50 round drum?? AGAIN? More pics after the jump, or check out the actual patent doco here.